Too busy to get things done ? Hire a virtual assistant ! Are you behind with your errands ? Need to spend more time on developing your business rather than pushing paper work? Excess workload, looking to cut down your overhead cost and need more business hours? Are you losing your business, just because you have less time and too much occupied with other work? If all this sounds rather familiar, look no further than Velan-VirtualAssistants - the complete remote office with a VA on hand to help you. Whether it's a 'one off' situation or a regular need, Our Virtual assistants can step in and take the load. "Joyce and her team are an excellent source for your outsourcing needs. Her team provides excellent service in a timely manner. When we assign tasks, they complete them flawlessly. They keep an open line ofcommunication and they catch on to what is being taught during training sessions easily. They have really assisted our company with taking things to a higher level with their proficient work." "Velan Info... Your Virtual Assistance is the way to go! 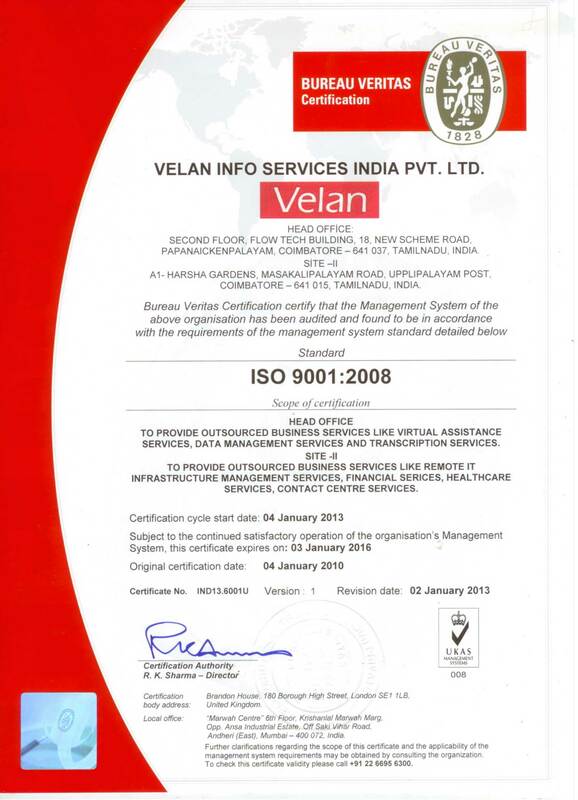 Velan Info help assist to making my work day move smoother. Thank you for helping our company grow!!" "I've been very happy with how easy it is to work with Velan Info. It's often times easier to work with them than folks in my own back yard. They use the latest technology to help communicate with clients, and have a great management system that gives you one project manager to talk to and a team to back it up. Thanks for all the great work guys!" "Velan has taken on projects that have not only increased our workflow but streamlined our processes at the same time. They are able to use talented personnel to the best of their ability to produce extraordinary results. With a high regard for quality and expedience, Velan's team members are hard-working, responsible, efficient and tireless. Velan is highly recommended." "I've been working with Velan for the past few months, and they have consistently exceeded my expectation for professionalism and quick response times. I have no hesitation in recommending them for their services." "Velan info services I am using for past few months and I quite happy with their services. They are professional and provide time bound servies.I would highly recommend them." "Velaninfo has been a reliable partner for us for almost two years now, providing both bookkeeping and general admin services. I'm very satisfied with the quality, speed, and flexibility of their work." "To date I have used Velan for two catch-up projects. I as most satisfied both with their performance and their desire to fulfill my needs. I would recommend them to everyone in situations where one is trying to update a set of records that have been neglected for some time." "I have found the service offered by Velan to be prompt reliable and typing to be extremely accurate."